" I was born in 1990 in New York City, but I grew up on Cape Cod- loving the ocean and the cranberry bogs. While attending Falmouth High School, in 2007, I started working at McDermott Glass Studio, learning the traditional ways of glass blowing. As many do, I fell in love with glass. After graduating high school I took a few art and business classes at Cape Cod Community College. It was hard to focus on school when my passion was at McDermotts. I expect to be continuing my education in glass for the rest of my life! 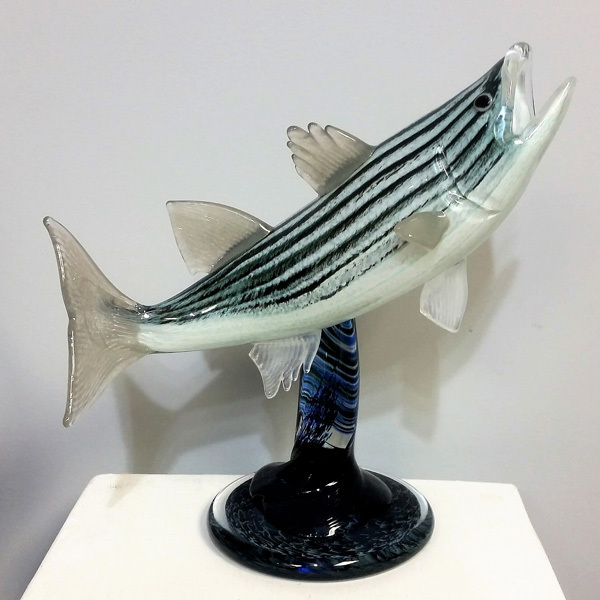 Working at McDermott Glass Studio has given me the ability to express myself through glass. I love making sea creatures, octopus, jellyfish, fish, turtles… you name it! Exploring the world of sculpture glass is just as exciting to me as learning to make vessels and blowing out different traditional shapes. The most fun I could have is to try something new, taking on the different challenges the glass presents. David, Yukimi, and Brian are kind enough to be teaching me and I am lucky enough to have them all as friends. I love the style of glass blowing at McDermott Glass Studio, I love and admire the people (and the dogs too), and I can’t wait to see what we come up with next!"